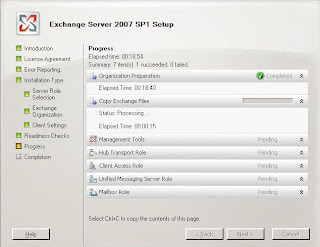 If you want to install the Exchange Server 2007 on different and dedicated hardware for each Server role the Custom Exchange Server Installation option will help you to choose the role you want to deploy on that particular box. The role selection screen allows you to install the desired Server role, take a look at below screen shot. Clicking on the Next button will bring up the next screen to allow you to choose the name for your Exchange organization. 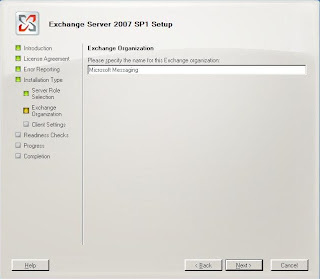 Please note that this screen will only appear if you are installing Exchange Server 2007 in a fresh AD environment with no legacy Exchange installation in it. If you already have an Exchange Server 2000 or Exchange Server 2007 organization running in your AD forest the setup will not prompt you to enter any organization name. 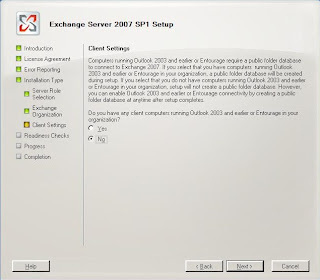 Then it comes to selecting the client settings where you can let your Exchange Server 2007 know if you are still using legacy clients like outlook 2000 and outlook 2003. If you have legacy clients running in your company you must select "Yes" and click next. Once all the required settings and namespace are defined to the setup program it will search for the prerequisites first of all, this check is indeed a part of Exchange Server best practices analyzer integrated with the setup program. These checks include the discovery of Active Directory configuration prerequisites, platform operating system readiness check, and Server role specific requirements check. After the organization prerequisites checks are passed the setup program proceeds with copying the required files to the temp Directory on the Server. These files are copied from the location <PLATFORM>\Setup\ServerRoles\Common and are stored at location <SYSTEMPATH>\Temp\ExchangeServerSetup on local computer. That’s it, once all of the chosen Server roles are installed the next screen confirms the successful installation by showing green signals. With the next post in this series I will try to focus on the things happen in background whenever the setup program is launched to install a Server role. This entry was posted on 17/10/2008 at 2:05 PM	and is filed under Exchange Server 2007, Setup. You can follow any responses to this entry through the RSS 2.0 feed. Both comments and pings are currently closed.